When Burke Museum executive director Julie Stein wants to relax, she strolls through the museum’s storage areas, where drawers and shelves are filled to the brim with carved Haida masks and reptile fossils and mammal specimens and Palauan story boards. Her favorite? The aisle with woven baskets. “You’re surrounded by hundreds of them and they smell like grass and cedar,” says Stein. The Burke’s collection includes more than 16 million objects, including collections of fossils, birds, fish, and Northwest Native art that are among the largest of their kind. Most items are hidden away in storage due to lack of exhibition space, but that will soon change. A new building is in the works, which will provide 66 percent more space as well as climate controls to protect the Burke’s irreplaceable collections. That magic includes research projects like the recent headline-grabbing discovery of the first dinosaur bone found in Washington state, now on display in the Burke’s lobby. Not all Burke research makes the news, but the museum’s curators—who hold joint appointments in the College’s academic units—are constantly advancing our knowledge of the natural world and diverse cultures by studying and adding to the Burke’s collections. The world-class collections are also used by visiting researchers, students, and the community. Northwest tribes and Pacific Islander groups have particularly close ties with the museum. In recent years, the Burke has sponsored an exchange linking Washington’s Suquamish Museum with a new museum in the Philippines, and worked with Alutiiq community members from Kodiak Island to build a traditional Angyaaq boat—the first in more than 150 years—using techniques relearned through study of objects in the Burke collection. 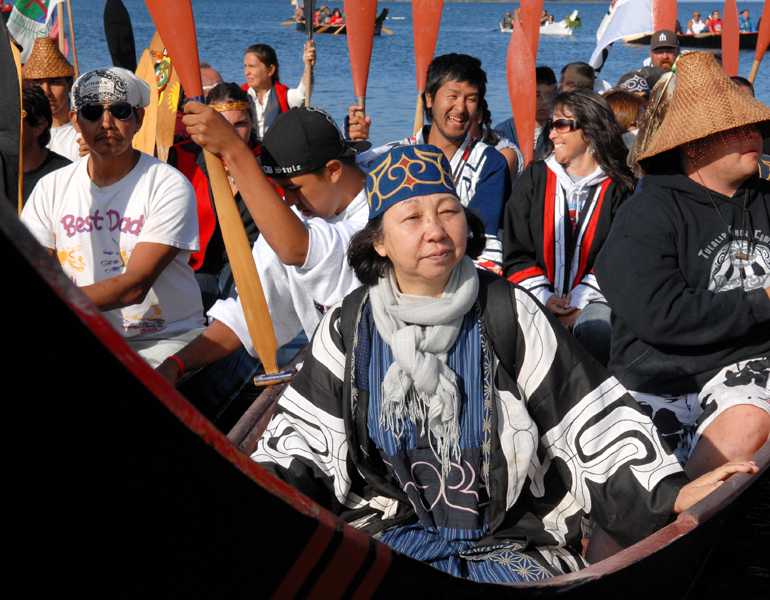 The Burke also coordinated a year-long exchange between the indigenous Ainu community of Japan and Washington state tribal groups, culminating with the Ainu participating in the Northwest coast tribes’ annual Tribal Canoe Journey. Such collaborations will continue and the museum will remain open during construction of the New Burke, which is expected to open its doors in 2019. You can help advance our understanding of the natural world and diverse cultures by giving to the Burke Museum of Natural History and Culture. When you support Arts & Sciences students, you create opportunities that wouldn’t be there without you. Your gift helps prepare tomorrow’s leaders, ensuring a brighter future for Washington and the world.